Focus Stacking – Macro shots that are continuously sharp from front-to-back – that is the goal of every macro photographer. The smaller the object being photographed and the lesser the distance, the narrower the area of focus becomes. With full-frame cameras, this field of focus can amount to less than a millimetre. The solution to the problem: photograph the object using multiple focal planes and FOCUS projects 3 professional will seamlessly assemble the photos together – all with the utmost speed and precision. Take a sharpness series of your subject. Macro objects and normal focal length are especially good for this. For full format cameras, it is custom to use blending between eight and eleven. Five or more shots with different focus layers are ideal to achieve continuous sharpness. 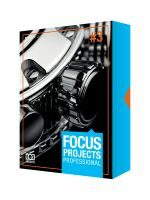 FOCUS projects 3 professional assembles the images together and establishes a perfect, complete picture with sharpness from front-to-back. Give it a try! There is no objective in the world that captures everything completely crisply, no matter how expensive it is. Some photographers have already spent a fortune trying. I simply use FOCUS projects to collect the sharpness information from multiple images. And the nice thing about it is, that at every time it was sharp somewhere! Whoever has experience in the professional or semi-professional photography field knows how tedious and demanding this work can be, and definitely wishes that they had discovered the goldmine that is FOCUS projects professional years ago. Shooting macro photos with sublime focus on each item on the photo isn’t that easy especially since the aperture sizes will more often than not drop to sub millimeter figures. Keeping the focus object sensible relative to its environment becomes almost a nightmare no matter how many objectives you try to hook onto your camera when shooting the photo. Focus Project 3 Professional suggests a better solution. Snap multiple focused images of different objects in the field of view and combine them into one photo with exquisite depth and focus. Focus Projects 3 Professional is exceptional at bringing out that harmonious focus you so much desire in your photos. Yes, you might have to go through a couple of steps and apply a variety of filters and enhancements to the up to 400 focal planes (more than enough to capture all the details in even the most detailed scene) but the product will be a stunning photo that is worth the effort. Other than just dealing with the focus, Focus Project 3 Professional also features a couple of editing presets that will cut down all your editing time with simple click to use settings and a retouching tool that lets you handle all the important post production edits and make this software a possible stand alone photo editor. Combine that many RAW, TIFF or bulky JPEG images will definitely draw a good amount of resources from your system. An intelligent automated image optimizer and a rather intuitive processing engine not only makes Focus Project 3 Professional lightning fast but also leaves you some decent resources to keep your PC multitasking as you process your photos. You will need some time and tutorials before you can push the Focus Project 3 professional to its limit and get the finesse you desire. This could be a deterrent to photography enthusiast but is nothing but a slight bump to the professionals as compared to the expensive business of buying and trying multiple objectives with each photo shoot. This is an amazing tool that fits a specific niche of users, people who take macro photos and are willing to use software to bring staggering clarity to their photos. It is undoubtedly easier than trying out multiple hardware swaps to achieve a result that is almost optically impossible.